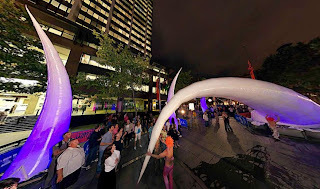 Airvag is a French company that installed a collonade of giant inflatable "horns" at the top of Martin Place in inner CBD for Sydney Festival. Here is a panorama captured on the eve of nightfall when these giant inflatable horns become light filled marker buoys as they begin to glow transforming familiar spaces. And here is another location of an Airvag installation.